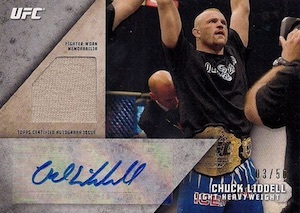 2015 Topps UFC Knockout continues with the line's focus on high-end hits. Every pack comes with either an autograph or memorabilia card. Spread through an entire ten-pack box, collectors will find a pair of autographed relics and three additional signed cards. 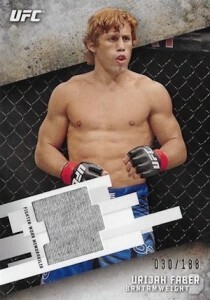 Autograph inserts are plentiful in 2015 Topps UFC Knockout. 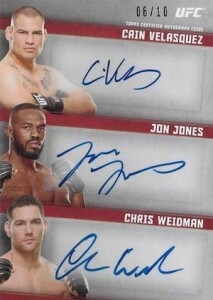 The most common are Knockout Autographs, which has a checklist of more than 40 fighters. Parallels include Red (#/8) and Mat (1/1). First-time signers are noted with a "First Issue" stamp. There are also relic versions for 25 fighters that have a piece of fight-worn gear. Scarlet Signatures (#/50 or less) and Scarlet Signatures Autograph Relics (#/10) add more red autographs to the mix. 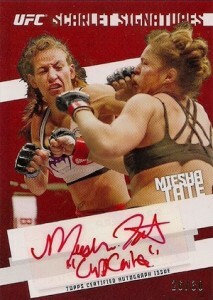 Moving to Knockout are Thoughts From the Boss Dual Autographs. 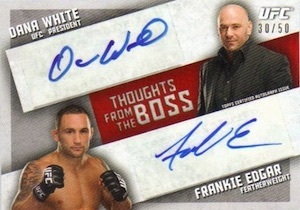 These serial-numbered cards come with an autograph from UFC President Dana White as well as a fighter. Among the product's other multi-signed cards are Three of a Kind Autographs (#/10) and Six Sigs (#/5). 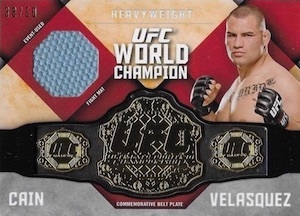 UFC's 2014 champs are honored on Championship Belt Plate Autograph Relics (#/8). These have a replic mini belt plate to go with the signature. These also have unsigned Relic versions (#/50) that have a piece of fight mat instead of an autograph. Knockout Relics come with pieces of fighter shirts or shorts. All are numbered. Dynamic Duels add a second swatch from an opponent. Collectors can also find dual-signed Dynamic Duels Autographs (#/10) and dual-autograph, dual-relic book cards (#/5). 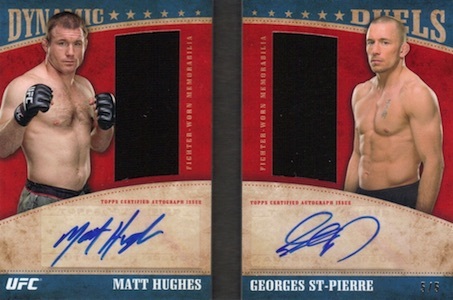 Dual Autographed Fight Mat Relics (#/10) have autographs from two people that faced each other in the Octagon as well as a piece of the canvas from their bout. 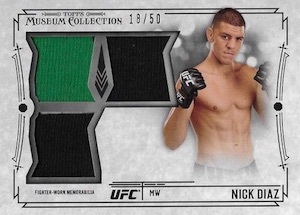 Rounding out the basic relics in 2015 Topps UFC Knockout are Fight Mat Relics. Each is serial numbered and has a piece of the mat embedded in them. Parallels include Gold (#/88), Red (#/8) and Mat (1/1). Mat parallels are printed on card stock that mimic the look and feel of canvas. Some of the biggest hits in 2015 Topps UFC Knockout fall under the Museum Collection. This stems from the high-end brand that has been used in baseball and football for several years. Museum Collection Autographs not only come with on-card signatures, but they come with a metal frame. Cards come in three versions: Silver Frame (#/15), Gold Frame (#/10) and Black Frame (#/5). 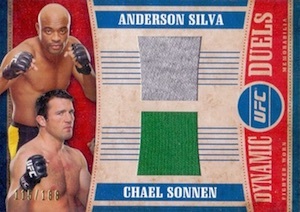 Significant Swatches Triple Relics (#/50) have memorabilia from three fighters while Primary Pieces Quad Relics (#/50) come with event-used swatches from four different combatants. Three levels of parallels are numbered to 25 or less. 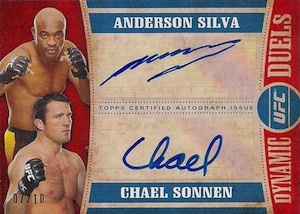 Signature Swatches Autographed Triple Relics (#/20) add autographs to the multi-fighter relics. 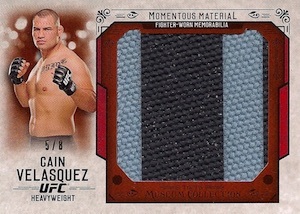 Momentous Material Jumbo Relics (#/25) have over-sized pieces of UFC, Strikeforce and WEC canvas. Momentous Material Glove Patch Relics are all one-of-ones that have the wrist strap from a fight-used glove. Sticking with the unique are Museum Memorabilia cards. Each of these one-of-a-kind cards have a massive relic piece that's signed by the fighter in silver ink. 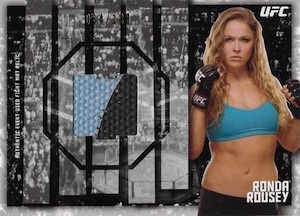 The 2015 Topps UFC Knockout base set has 100 cards. Inserted one per pack, numbered parallels include Silver, Gold (#/99), Red (#/8) and Mat (1/1). Randomly inserted are 20 redemptions for a signed fight glove. Also, some boxes have a Fistograph box loader. 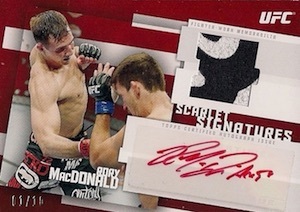 Numbered to 10, these have a fist imprint from a fighter as well as an on-card signature. 2015 Topps UFC Knockout Fight Mat Relic Card. Miesha Tate. #159 188 produced. 2015 Topps UFC Knockout Significant Swatches Triple Relic Card. Royce Gracie. 2015 Topps UFC Knockout Fight Mat Relic Card. Eddie Alvarez FMR-EA. #27 88. 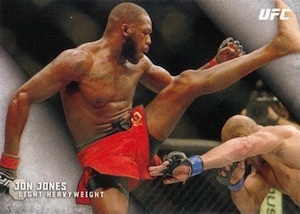 2015 Topps UFC Knockout. Corey Anderson Certified 1st Autograph card! #KOA-CA. 2015 Topps UFC Knockout Triple, Anderson Silva Fighter Worn Memorabilia. #42 50. 2015 Topps UFC Knockout Relic Card. Georges St-Pierre KR-GS. #48 50. Fight Worn. 32 cards. Serial numbered #/299 or less. 10 cards. Serial numbered #/188. 15 cards. Serial numbered #/188. 40 cards. Serial Numbered #/50. 25 cards. Serial numbered #/188. 39 cards. Serial Numbered #/50. 15 cards. Serial Numbered #/20. UFC Knockout is one of the products that I look forward to every year but sadly the product did not live up to last year’s product and my complete expectations…. 4. I did not have any redemptions!!! 1. Collation was not very good. We opened 1/2 a case and had lots of double and triples of the base cards. In one box we had 2 hits from the same fighter (one auto and non-auto patch) hit 2 times. To me, that is a major buzzkill for the product. 2. Hard to tell parallel levels. 4. Lots of old mid-card fighters have hits in this product. The active UFC roster is now near 500 so there is no reason to reach for filler anymore. This was once the case in the early products but should not be in the sports marquee card product. Shane Carwin and Dan Hardy are both long retired and both have hits in this product. With UFC Finest no longer in production, this is the only UFC product to buy but temper your expectations. Knockout is definitely a step up from Bloodlines but this year the gap is much smaller.